Auto Retro Barcelona came to an end yesterday after four days of exhibition in the Fira de Barcelona venue. I am not a big fan of classic cars or motorbikes, at least not from the point of view of engines, value and so on. What I do like is the aesthetic aspect of these collector's exhibits, especially when you can capture them in your pictures. Admission fees were a little above my standards (not being a fan and all) so I wandered about the esplanades at the entrance where improvised parking lots lodged some beauties you could easily snap. This was the case of this black Citroën. I've had a hard time identifying the brand and finding a proper link but I think this model looks pretty much the same. 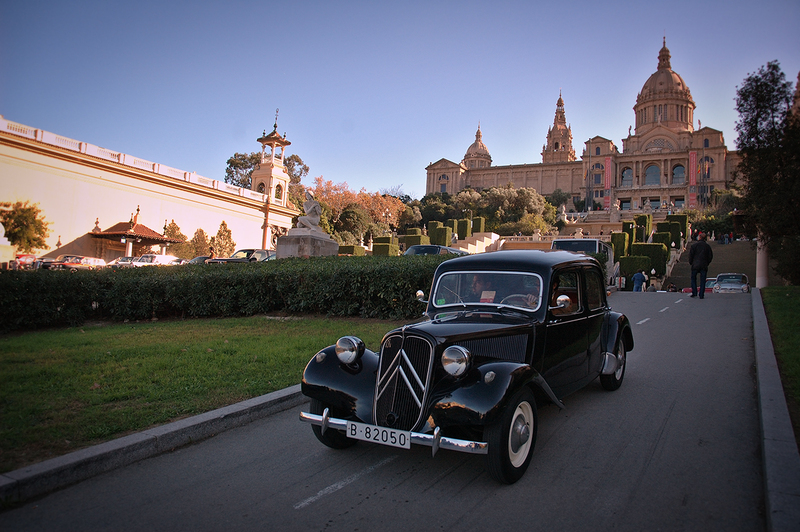 Fortunately, it appeared unexpectedly driving down the access road and against the marvelous Palau Nacional building in the background where MNAC (National Art Museum of Catalonia) is. If you want to know about the history behind Fira de Barcelona i.e. the International Exhibition of 1929 please check my previous posts about this topic. Excellent capture! It looks like an ad in a glossy, toney magazine. although i dont understand the cars, i mean the machines, but i like to see some beautiful cars,some old style, very elegant as i see. the sky is always nice. I love going to car shows, but the background here looks better than the cars! Fuimos en diferentes momentos al mismo lugar eh. Congelaste el tiempo, es más, creo ke lo hiciste retroceder y nos llevaste en ese viaje al pasado. Lo siento Valery lo había rechazado por error, por eso lo copio aquí tal cual. Un saludo. Felices Fiestas para tí y los tuyos.